i read the forum through and through, but now, after over an hour, im frustrated. but its a zip file. i tried to copy it to the 2 folders in my graphics folder. (patches and plug-ins). it didnt work. im stuck....can anyone help me? i didnt find something with google. its linking me always back to this forum. The author of SingleMarkerDetector is just providing the source code, not a compiled version. You need to build it yourself. Open the .xcodeproj, go to the Build menu, and click Build. When that's finished, you'll find a build folder inside the project folder, and Debug inside that. Copy the .plugin file to <your home folder>/Library/Graphics/Quartz Composer Plug-Ins. Check out this thread from a few days ago. I posted a zip file containing the built plugins. I think the default settings for that one are a 32 bit build. You'll likely have to go into build settings and select 64/32 bit build mode. 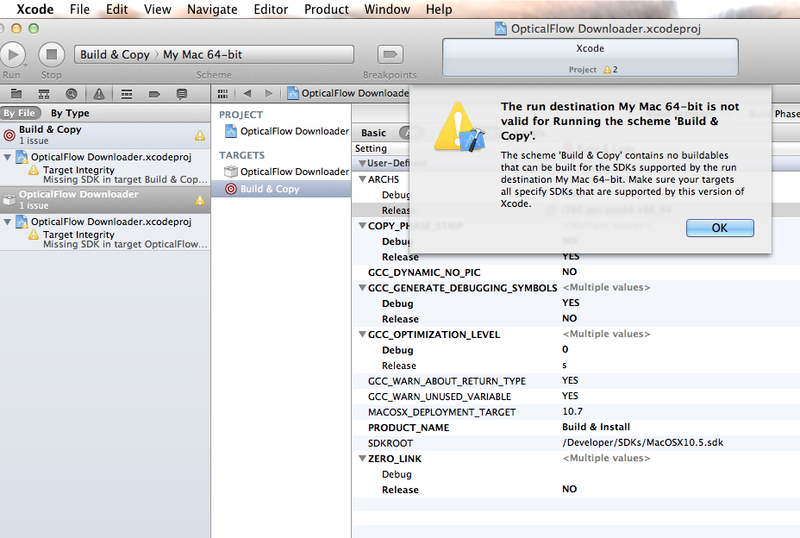 I just checked the ADC, and I can't find that Xcode project, even though a few other plugin projects are available. It was included in the 10.5 Developer Tools. On the case of the v002 plugin, I believe that only works in 32-bit mode because of the fact that Quicktime is only 32-bit... and "Quicktime X" is the 64 bit thing, that doesn't really have a lot to do with "old" Quicktime. yes done now i have opt. flow again! 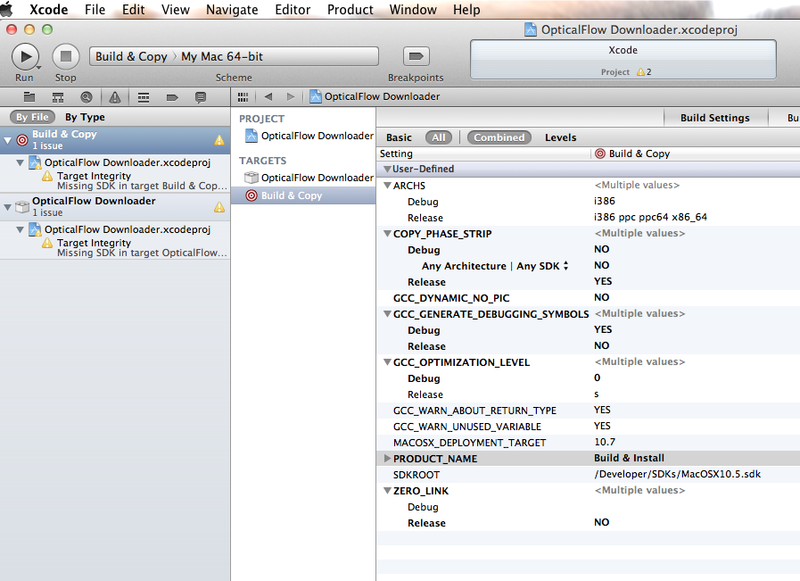 ;-) chanded the architecture in xcode. chiara - You are missing, or have not set, the appropriate SDK in your xCode projects. Man, no. Movie Player is totally 32 and 64 bit complaint, and has been for some time. Ensure you have the latest version please? i guess i have latest version, yes. Srry Vade... I couldn't remember (I did try to use equivocating words, I think). I've build the matrixtoparams for lion. But I cannot find the latest version of the movie player v02...... anyway many thanks guys.